Reverend Jen Miller is an Art Star, organizer of the Mr. Lower East Side Pageant, and curator of the Troll Museum, has brought weirdness and joy to the LES and beyond for years. 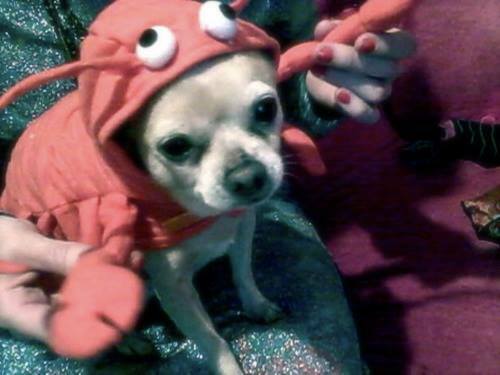 Now, she’s asking for our help by holding a benefit show for her elderly dog, the Rev. Jen Junior, who’s in need of surgery and medical care. 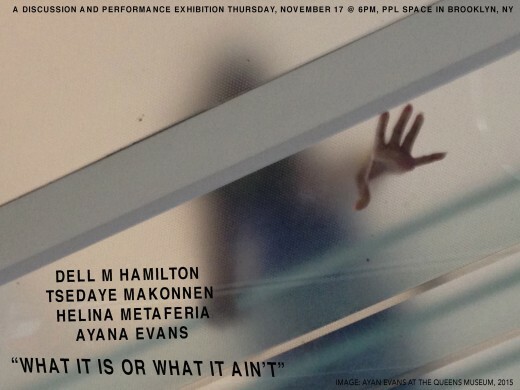 Thursday Dec. 17, 6 pm at Panoply Performance Laboratory: $5- $20 suggested donation. Stroll over to Panoply Lab, one of the remaining weirdo DIY art spaces left in good ole Williamsburg, to catch this one-night-only performance art exhibition featuring four American performance artists discussing and performing (duh) their experiences in love and relationships and recollecting the ups and downs of working with an agency in a world of art institutions. Join Mx Bond and several musical misfits in an evening of tipsy cheer and song, where one can simultaneously light up with holiday cheer and get lit. 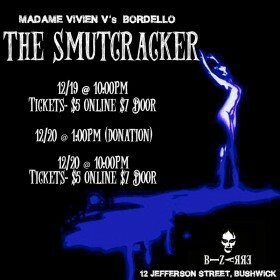 Saturday Dec. 19 (10 pm) and Sunday Dec. 20 (1 pm) at Bizarre: $5 in advance, $7 at the door. Feast thine eyes upon Bordello’s regular cast of performers plus some special guests, including fire dancers, drag queens, and aerial performers. You best believe it’s going to get steamy. And it’s not only a show: attendees with higher stamina are welcome to party with the cast afterwards until 4am. 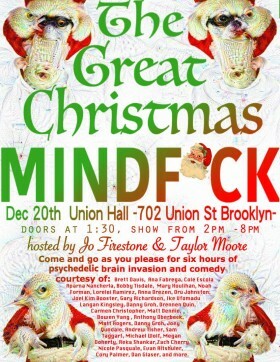 A bevy of Brooklyn’s wildest comedians and wackiest performers come together for this six hour long (yes, you read that right) marathon of holiday madness. One of the brains behind this ambitious endeavor is, unsurprisingly, Jo Firestone, creator of Punderdome 3000, director of B+B favorite Body, and too many other creative and just plain bizarre shows to mention here. The lineup is rightfully jam-packed, and we trust that it will be full to the brim with surprises, shocks, and sillies.